Question: What’s the difference between Microsoft.MetadirectoryServices.dll and Microsoft.MetadirectoryServicesEx.dll? MIIS/ILM code is using the Microsoft.MetadirectoryServices.dll, while FIM is using Microsoft.MetadirectoryServicesEx.dll. Can the old DLL be removed from the FIM code extensions, when the new DLL is referenced in code? You should use the Ex.dll when possible. The other DLL is only there in case you have a DLL from MIIS, has lost the sources, and cannot recompile it. The only difference between the two is that Ex is digitally signed and the other is not. When you have changed the references to Ex.dll you will not need the other. Just got the confirmation that I’ve been re-awarded the Microsoft MVP award on Identity Lifecycle Manager, already the 4th year. It’s really a great honor and it’s very much appreciated. First of all I wish to thank all people that supported me to keep up the good work the last year: the community, the MS Product Group, the Winsec companions, fellow MVPs, my colleagues, William Jansen, Gaby/Jacqueline, … all of you! Special thanks to Markus, Eric Battalio, Ed Price, for their continued support on the ILM/FIM Forums and Wiki! Let’s rock for another year! Thank you, Paul, it’s always a pleasure to work with you running the Winsec User Group. I really appreciate your continued support. And last but not least my wife Katrien: it’s not always easy to live with an IT Security/Community freak like me. You all made it possible to keep up the good work! READY for ANOTHER YEAR of good work! As you probably know, in ILM the MV schema can be changed easily. It’s pretty easy to add or remove attributes. In the past, in some cases, customers had the MV completely removed and rebuilt to only contain (just) the object and attribute definitions needed. Fit to the customer’s standards, without overhead. In FIM it still is quite easy to manipulate the FIM Sync MV schema at will. Easy! … at first sight. NOT! Because the FIMMA doesn’t like it. If you add the FIMMA after you change the default MV schema, you could run into trouble. That is, the FIMMA the wizard checks the MV schema (note the Update Schema step). 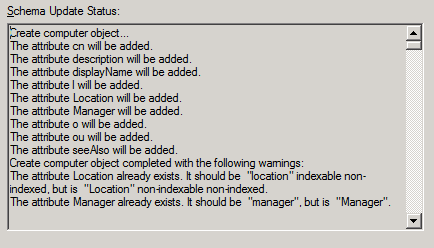 And if one or more default object definitions are missing, the wizard prompts you to update the schema. AFAIK, strangely enough the option is not triggered when all default objects are present, even if some default attribute definitions are missing. You’ll need to click Next> to continue installing the FIMMA. So, there’s no option to continue installation without changing the MV, even not partially. In the demo setup I use for the screenshots, the following objects were removed, because they were not managed by FIM: computer, domain, function, locality, organization, printer, role. Additionally, the group object had been created manually as “Group” (uppercase “G”). Same thing for OrganizationalUnit, … and some attributes. The attribute <missing attribute name> will be added. The attribute <changd attribute> already exists. It should be “<default name>” indexable non-indexed, but is “<changed name>” non-indexable non-indexed. The attribute Manager already exists. It should be “manager”, but is “Manager”. Apart from automattically adding missing attributes, the wizard also duplicates attributes that already exist to match the object. So it restores the link between the attribute and object. But it does NOT change the attribute type. Just an example, if you completely removed the ‘street’ attribute from all objects, the wizard will add it again as String(indexable) and map it to the appropriate objects. BUT, if you created the attribute ‘STREET’ (as Binary (non indexable)), you’ll get a notice the attribute ‘STREET’ already exists, although is should be ‘street’… And again the wizard maps ‘STREET’ to the default objects where it is supposed to be linked. – Stick as much as possible to the standard FIM Sync MV Schema.